There's a reason I'm not a carpenter, or a handy man. Those people think differently. Try as I might to "enjoy" working with my hands or to love creating something with power tools, or appreciate "working with wood", I just can't. Saturday was testament to that distaste in so many ways, its hard to describe. It started with the idea of buying a fishing rod rack that I saw in the black Friday sales flyer for Menards. Bear in mind that I NEVER go out on black Friday, but we needed solar salt and a furnace filter anyways, so I figured I'd see if I could save $15 on the rack and get my salt and filter too. Menards was a madhouse. The pace was frantic and exhausting. I found myself buying right into it when, at one point I had a fleece throw in my cart that cost $1.50. Later on, I was looking at $14 dog beds for no good reason. Luckily, I came to my senses and abandoned the throw on a shelf and skipped the dog bed. I got my rack, salt and filter and headed for home. It was an education in how crazy our culture has become, and how easy it is to get caught up in it. It was traumatizing. In any case I got home and set about the 15 minute job of putting up my fishing rack. Ready, fire, aim! 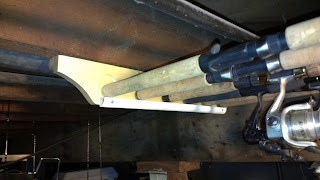 Even though the rack was built as a stand-up rack, I thought I would mount it on the ceiling, thereby keeping my rods out of the way. No problem, four screws and I'd be done. Zip, zip, lickety split. Because the brackets were the type where you put the screws in first, and then slide the rack in and to the left thereby locking it, I started with he first screw. I screwed it in and carefully measured 15 3/4" away to place the second one. Well, the tape was actually upside down, so I measured to roughly where the 15 3/4 mark was. I sunk the second screw, went to slide the rack into it and, low and behold, the screws were misaligned. Argh! I removed the second screw, resunk it, replaced the rack and it worked. A bit wobbly, but it would do. Halfway there, I think to myself. I begin to set the screws for the top half of the rack which is designed with a curly-cue slot where the rods can slide into. When I go to set the rack into the two screws, I realize it's wobbly too. Too wobbly to work with. I size up the problem and decide to screw right through the rack's body. It would look a bit "custom," but, by God it would not wobble. So, I unsink both the screws and find two longer ones in my can-o-screws. I drill those in tight and think to myself, halfway there now, for sure. I fill all the slots with rods and stand back to take a look. I realize that the curly-cue holders are not going to work in a ceiling configuration because the rods could fall out as vibrations from upstairs move them into the opening, thereby releasing them to fall and potentially snap. Gotta fix that, I think to myself. 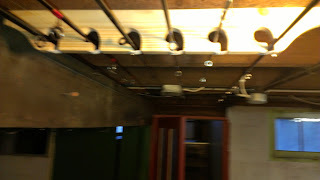 As I begin to remove the rods from the rack, the lower base falls off of it's two screws and all the rods come crashing to the floor. Argh! Gotta fix that first, I think to myself. I'm now 45 minutes in and am beginning to think about hiring a contractor. As I'm fairly frustrated now I get two longer, thicker screws from my can-o-screws and drill a couple of pilot holes into the lower rack's body. The first screw I try is a bit too long and thick to drive in. I realize this after it is entirely through the rack. When I try and remove it, I proceed to strip it and can no longer unscrew it. I resort to hack-sawing off one end and then using my RoboGrip to unscrew the other end from the rack. Momentarily, I contemplate scrapping the whole project and just selling the six rods. Problem solved. I take a breath find two new shorter, more reasonable screws from the can. I drive the longer screws into the rack and then into the floor joist above. The rack continues to take on a custom look. This is not always a desirable thing. Almost there now, I think. I then cut 6 short pieces of plastic anchor tape and screw them the top six holes, closing the gap enough to hold the rod tips securely. The design was pure genius. And quite custom. I replace the 6 rods again and as I'm putting the sixth one in, one of the others falls out of the shallow base. and dangles by its tip. I cannot print what I thought to myself at this point. The fix would require a piece of wood underneath the 6 holes at the base of the rack to keep them from sliding out like the one I just described. So I rummage through my woodpile and find an old piece of white quarter round molding from another woodworking project. Do I think about how white will not match the natural wood color of the rack? Why certainly. Do I care at this point? Absolutely not. It'll be even more custom, now...I think to myself. I find the first two non-matching screws I can find (custom again) and sink them into the quarter round as quickly as I can. I replace the six rods and stand back a third time to take a look. Now, that is one awesome rack! Man, I am good. And so, my love for working with my hands continues to escape me. To those of you out there who do it, enjoy it, and are good at it, I commend you. I also tell you to not judge. It's like art, or writing, or math or cooking, it doesn't come easy to everyone, despite valiant attempts. In the meantime, I'll continue to work at it, but don't be looking for me to be making that homemade hutch real soon.